Yeah. Pinched back nerves are often very painful. If you’ve ever had the displeasure of having one, you can probably relate. Spinal nerves are the most susceptible to pinching. Part of the reason is that these nerves extend to so many areas of the body; hence, when the nerve pinches, the pain can radiate along the nerve and spread to other body parts. For example, nerves exiting the cervical area of the back extend to the arms, hands, and fingers. When this nerve is compressed, pain is felt in those areas. Rarely, other conditions – such as infection, tumor, or a slipped vertebra may cause nerves to pinch. There are two main types of nerve fibers, sensory and motor. As such, when a nerve is compressed, one or both functions may be affected. Further, the severity of compression on the nerve will dictate the degree in which symptoms are felt. Sensory nerves transmit signals from a part of the body to the spine. Motor nerves originate in the brain and are transmitted via the spine. Distinguishing between the two nerve types is key to understanding the symptoms of a pinched nerve. Now that we have an idea of what constitutes a pinched nerve, what potentially causes it, and the difference between sensory and motor nerves, let’s take a look at some of the potential signs of the condition. When one of the sensory nerves of the back is pinched, the strength of signal is adversely affected. This impairs normal sensory perception, which can be felt as a dulling or numbing sensation. For example, a pinched sensory nerve in the cervical or thoracic areas may lead to numbness in the arms, fingers, or hands. Many of the routine things we do – typing, writing, walking, etc. – are taken for granted. However, these actions would not be possible without proper motor coordination. When motor nerves are pinched, the brain can not accurately perceive feedback. Given that motor coordination is a two-way street (feedback to and from the brain), the brain and body’s ability to stimulate the proper muscles necessary for motor coordination diminishes. The strength and longevity of our muscles depend on two things: mass and contraction, respectively. When motor nerves are pinched, the functionality of contraction is impaired – this is felt as muscle weakness. In rare but severe cases, muscle atrophy (or shrinkage) occurs. Of course, the earlier that muscle weakness is detected and examined, the better the prognosis. Pain and/or burning sensations surface when the root of a sensory nerve compresses. The most commonly reported symptoms include: burning or tingling of the feet, buttocks, legs, thighs, or lower back. These areas are often not where the actual problem resides, however. For example, it’s common to feel pain in the thigh region and think (naturally) that’s where the problem lies. But with pinched sensory nerves, it’s likely that the problem originates from a compressed femoral nerve in the lower back region. A pinched nerve may also manifest as a radiating (“shooting”) type of pain, usually felt in the legs or lower back region. 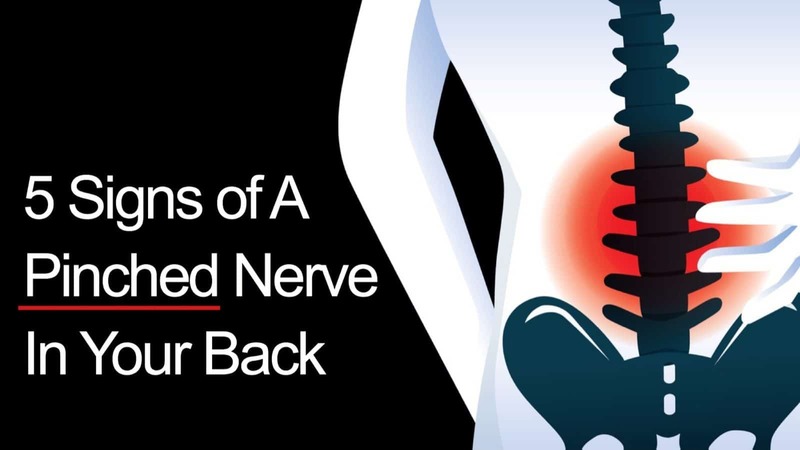 A pinched peripheral nerve may also induce muscle spasms in the lower back, which can be very painful. Sciatica, a condition that includes shooting pains of the lower back, hip, and outer side of the leg, is caused by compression of a spinal nerve root in the lower back. – Take an anti-inflammatory medicine, such as Aleve or Advil. “If your pain persists more than a couple of days, make an appointment to see your doctor,” says Eidelson.